The Norcar ProDrive drive system is an excellent choice for anyone wanting maximum control over the loader’s characteristics. The ProDrive system offers you full control over both the loader’s drive power and speed simultaneously. The engine’s RPM is governed by a gas pedal operated with your right foot. With the ProDrive system, the engine’s RPM can also be adjusted by means of a hand throttle, allowing for an efficient use of hydraulic equipment, such as lawn mowers. The direction of travel and speed are adjusted softly and seamlessly with the left foot pedal without you needing to move your foot. 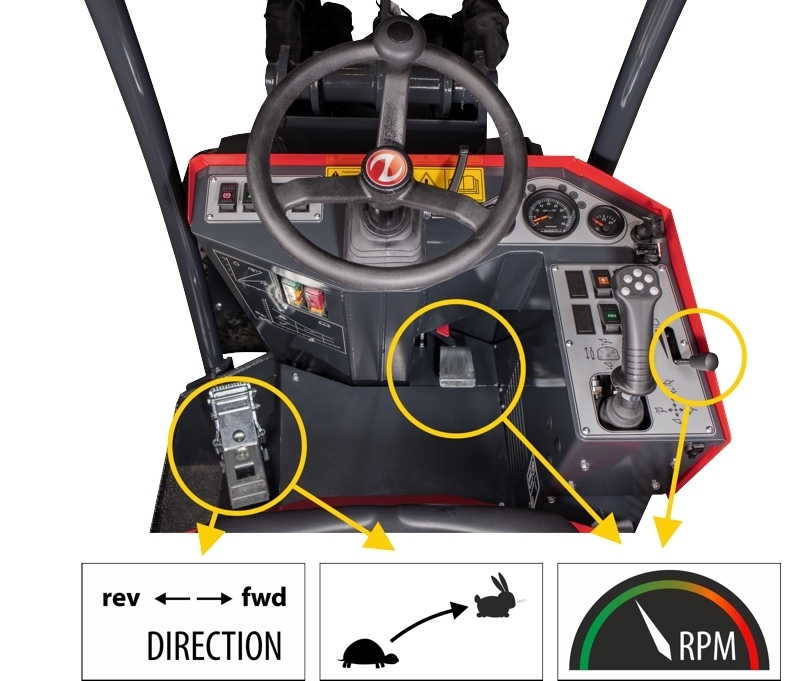 The machine is operated simply by pressing the pedal forward or backard for driving, while the loader remains stationary when the pedal is in the middle position. One great advantage of the ProDrive system is the ability to use the foot throttle in order quickly to adjust the engine’s RPM for faster lifting and for more power, or else for calm and silent driving when the power is not needed. The ProDrive system is well-suited for work requiring a high degree of precision, e.g., working on green areas, stone paving and demolition work. Driving a Norcar loader with the EasyDrive drive system is, as the name implies, easy. With the hand throttle, the engine’s RPM can be adjusted to suit the given application and to the needs of any hydraulic equipment. Operation is soft and seamless when using the two separate pedals for driving forward or backward. The pedals are operated with the right foot, and they offer a relaxing and ergonomic driving position. The EasyDrive system is well-suited to situations in which there are a great number of users, e.g., for rentals, in stables and for private users. Operators quickly get used to handllng the loader in a safe and efficient manner with the EasyDrive system. Norcar’s Automotive drive system is a good choice for those looking to get the most from a loader. This system grants the operator total control over the engine’s PRM and transmission when driving forward/backward. The direction of travel is selected by a button on the loader’s control stick. 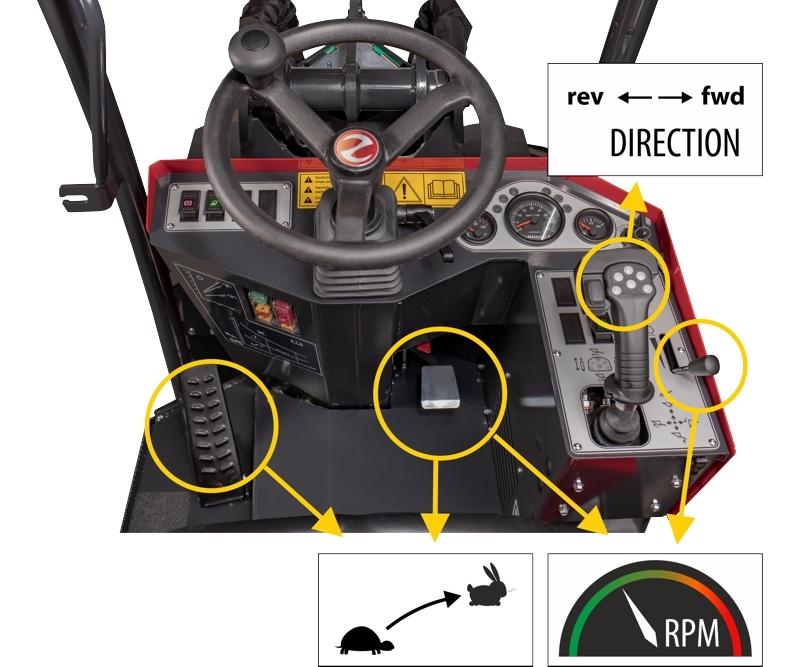 With the Automotive drive system, the engine’s RPM can also be governed by a hand gas throttle, allowing for an efficient use of hydraulic equipment, such as lawn mowers. 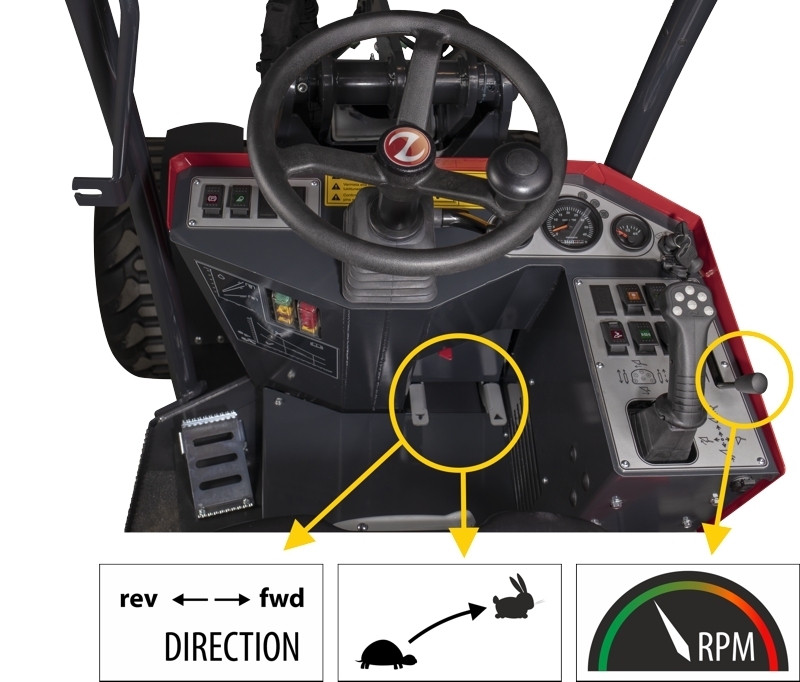 The loader’s driving speed and the engine’s RPM are governed by a gas pedal operated with the right foot. At your left foot, there is a combined brake and clutch that allows you manually to reduce the driving speed, even at a high RPM, e.g., during loading work or when using equipment requiring a high engine RPM. The drive system is easy to run and is excellent for loading, as well as for more continuous driving along roads and streets. Operating the system can be likened to driving a car with an automatic transmission.